Kyubit BI OLAP Tools provides web-based OLAP analysis features designed for MS Analysis Services business intelligence environment (Multidimensional and Tabular models), OLAP data analysis, interactive visualization, sharing and integration of OLAP reports. 'Kyubit Business Intelligence' is set of web-based OLAP Tools designed for MS Analysis Services environment (SSAS) with features to analyze, visualize, share and integrate OLAP data. Quick and simple installation, rich and interactive analysis are some of most popular remarks for Kyubit OLAP analysis software. Kyubit Business Intelligence OLAP Tools includes ad-hoc OLAP analysis within OLAP grid or OLAP chart and makes essential analysis operations very easy and intuitive. Use various OLAP tools provided by Kyubit BI application to create analyses, reports and dashboards based on multidimensional or tabular OLAP data. After connection to your OLAP cube is created in Data sources, each authorized user can quickly create new OLAP analysis, by simply drag-and-drop measures and dimensions, creating slicers, drill-down, expand and use other numerous ways to explore and deep search OLAP data finding answers and insights to particular analytic questions. Kyubit OLAP tools provide ad hoc 'Named Sets', 'Calculated Measures' and 'Drill-through definitions' directly inside Kyubit application, which are instantly ready for usage and sharing with other users. To prepare reports for end-users (less analytic options on the screen), use a variety of cell formatting options. 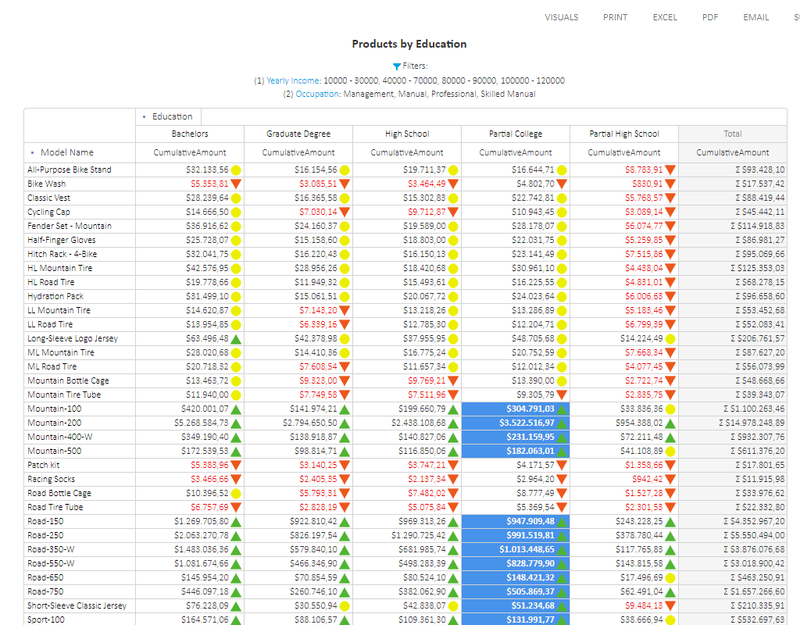 Set cell colors, Grid KPI icons and text formatting depending on the values thresholds. Create OLAP Time Intelligence slicers, that will be useful to prepare time relative filtering. 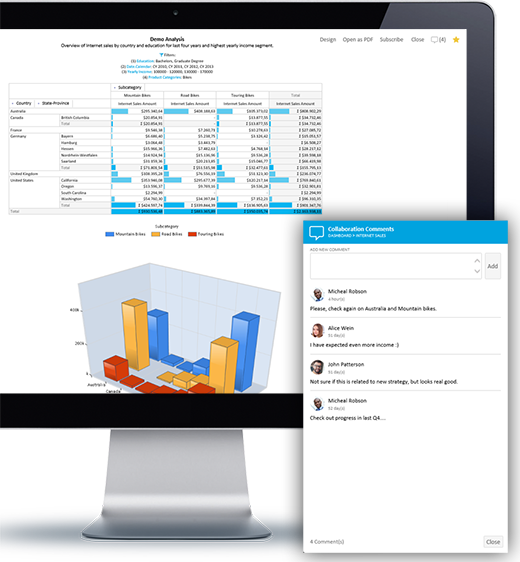 Create interactive dashboards that use data from existing analysis, schedule subscription to receive OLAP report on your email, use mobile devices to reach your OLAP data or embed analytics to your own HTML page. It takes a few minutes to download, install and utilize Kyubit OLAP Tools. 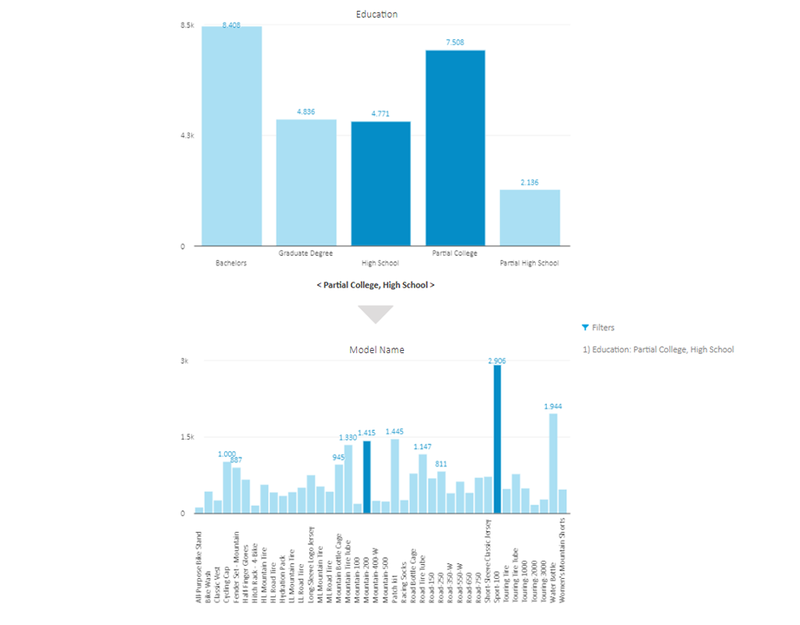 Interactive charts for OLAP analysis and visualization with Kyubit OLAP Tools. Dynamically define drill-through columns to show while drill-through with OLAP tools. OLAP report data integration within other web application (SharePoint). 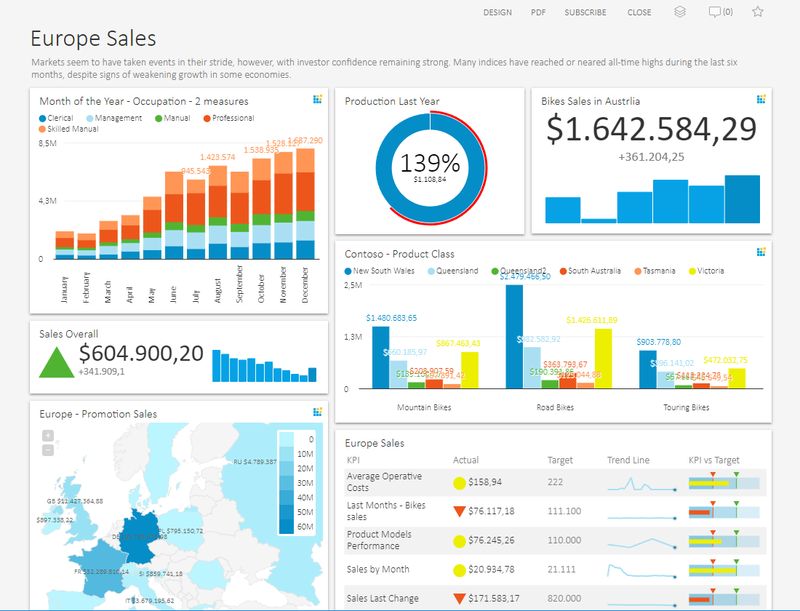 Use created OLAP analysis to present your OLAP data on the Dashboard. User interface and interaction are an important part of 'Kyubit Business Intelligence' and OLAP tools usage for end users. Drag-and-drop any OLAP element to the analysis area to start OLAP analysis. Dimensions, hierarchies, levels, measures, named set, user calculated measures are easily being dropped to the analysis screen. 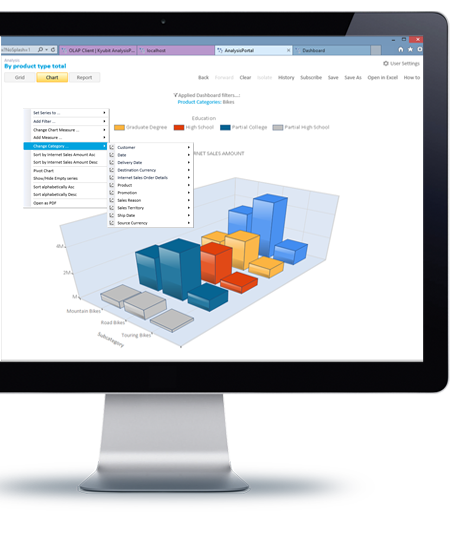 'Kyubit Business Intelligence' application supports a variety of standard OLAP operations for analytic purposes. Analyzing multiple measures with categories and series, drill down members, filtering and slicing, expand-collapse members, drill through for additional details, pivot categories and series, sorting members of dimension levels with advanced options, level filtering etc. 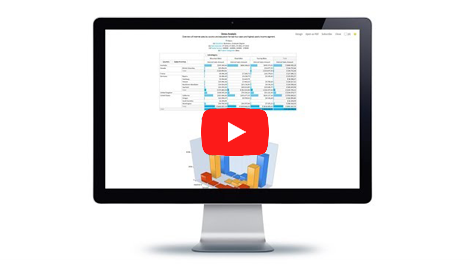 While analyzing OLAP data with Kyubit OLAP tools, it is possible to switch to visual analysis with a chart at any time or go back to grid analysis. 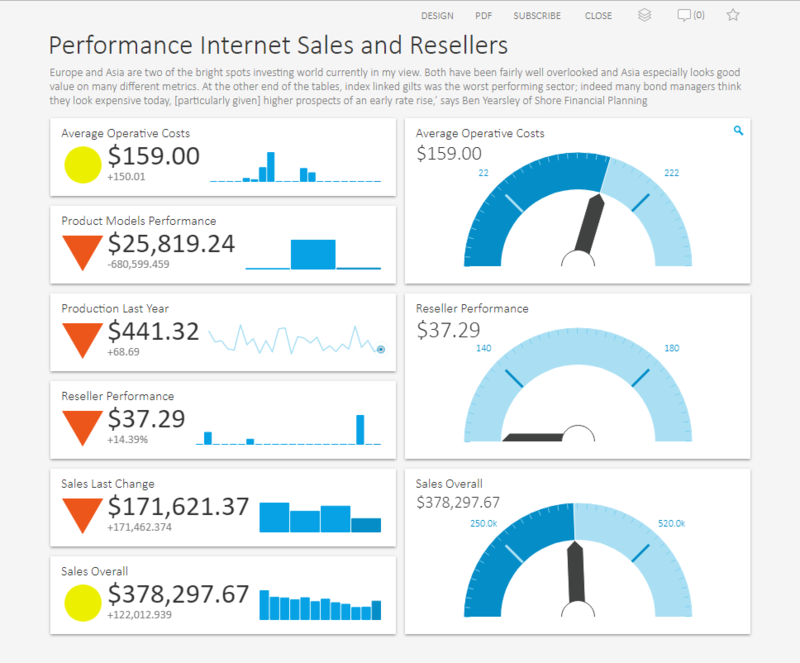 With charts analysis, a user selects chart elements for additional OLAP operations and see results as new chart immediately. There are a number of different chart types that are appropriate for certain analysis type, while 3D chart types visually enhance analysis experience. After analysis is created with Kyubit OLAP tools, it is the ideal point of share with other users for analytic or reporting purposes. Security concept allows analysis to be shared with other Active Directory (or local machine) users and groups. 'Kyubit Business Intelligence' impersonates the current user, so the particular user will see OLAP content for which current user has permissions in OLAP database within SSAS environment. 'Kyubit Business Intelligence' users could be subscribed to created analyses and reports, and receive an email with analysis at the scheduled time. 'Kyubit Business Intelligence' has its own The subscription service that is handling subscriptions within a scheduled period. The subscription will deliver embedded analysis within email message or link to Analysis report on 'Kyubit Business Intelligence' site. Monitor success of your business goals with KPIs (Key Performance Indicators) & Scorecards that are based on your OLAP data with Kyubit BI OLAP Tools. Set alert emails that are triggered by particular KPI status. Use KPI/Scorecard application section to create KPIs that are based on created OLAP analysis or group such KPIs into scorecards. Display KPI as KPI Icons, Goal meters or Gauges. 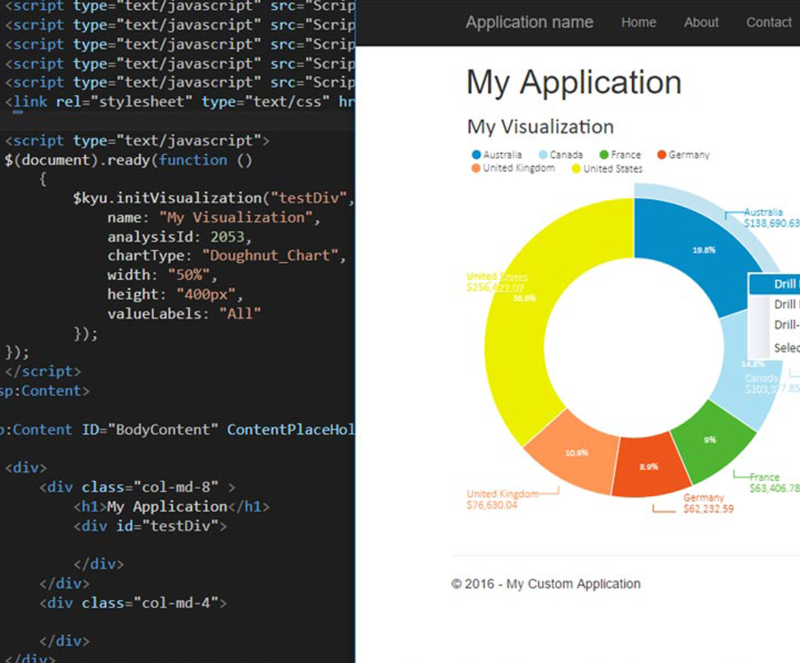 Use Kyubit BI OLAP tools to embed OLAP analytics to your own HTML page and discover ways to integrate Kyubit Business Intelligence features with your website/application and use embedded analytics features on your existing site or application. 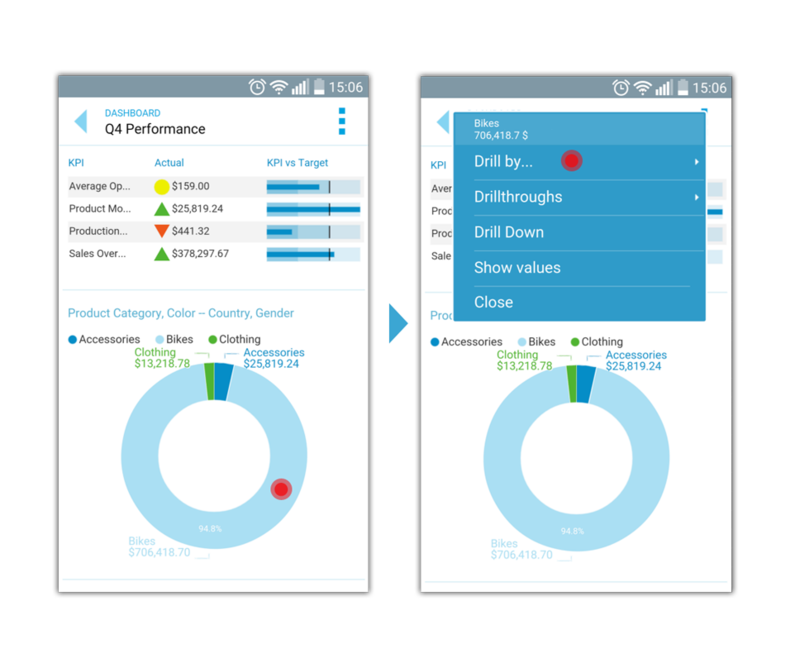 Use Mobile BI feature for OLAP analysis with Drill-Down and Drill-through actions to find more in-depth details of your data with the touch of your fingers on the Dashboards Mobile BI view. Select OLAP dimension level to Drill current data with multiple Drill-Down steps or get back to the previous state of analysis. 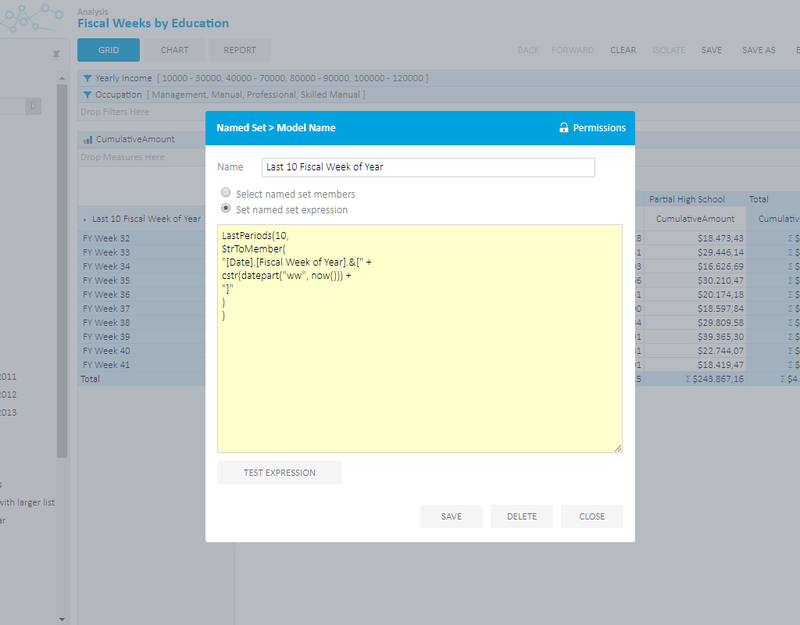 Select the predefined Drill-through action that will return row details of the current OLAP visualization. 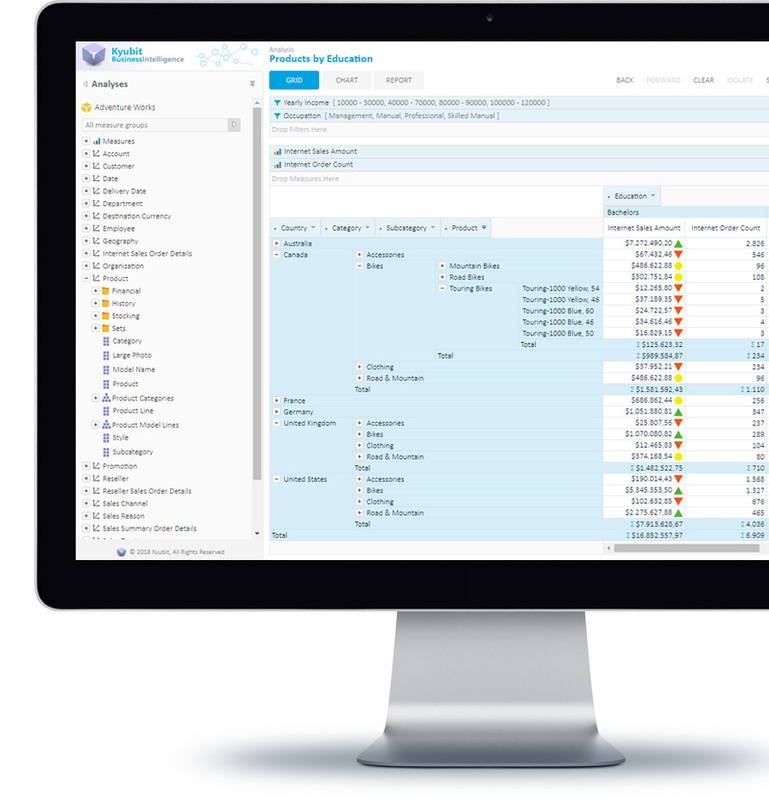 Download 30 days evaluation of 'Kyubit Business Intelligence' and its OLAP tools and try OLAP analysis features in action. Download 'Kyubit Business Intelligence OLAP analysis - User Manual' which covers all aspects of OLAP tools usage.